If you missed your shot at free Baskin-Robbins earlier this month, the free springtime cones haven't dried up yet. Tuesday, May 8 is the annual Free Cone Day at Häagen-Dazs. It's awfully simple to participate. Find your local Häagen-Dazs location, drop in between 4pm and 8pm, and get your free ice cream. That's it. You don't have to give up your email address. You don't have to download an app. You don't even have to attempt something impossible like, say, explaining Kanye West tweets. They'll just hand you one free scoop of ice cream or sorbet in a cup, sugar cone, or cake cone. Today is #HDFreeConeDay! Show us how you indulge with a photo of your free scoop from one of our shops! In addition to making you happy, the ice cream purveyor is using the day to make honey bees happy. It's the 10th anniversary of the company's Häagen-Dazs Loves Honey Bees initiative. The initiative aims to raise awareness about declining honeybee populations and funds to help reverse the situation. Häagen-Dazs's "The Extraordinary Honey Bee". The company is encouraging Free Cone Day participants to make a donation to the Xerces Society, which is attempting to plant more than one million acres of habitat for bees. 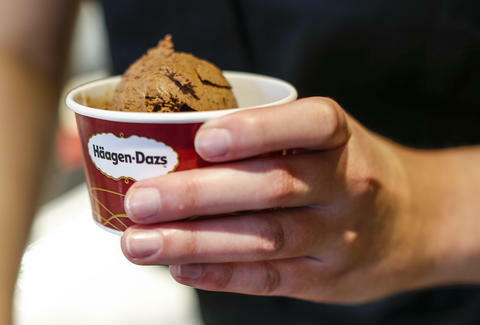 Since 2008, Häagen-Dazs has donated more than $1 million to support bee research education through UC Davis, Penn State, and the Xerces Society. Additionally, it's helped plant more than 11,000 plants to build a year-round pollinator habitat on the farm of one of its suppliers. So, if you twist the logic a little, you're saving the bees by eating free ice cream. Good for you.